The annual Hemophilia Walk & 5K is coming up in September! It’s your chance to help those affected by inherited bleeding disorders– while having some fun yourself! There are two walks: Reno on September 17, and Las Vegas on September 24, 2016. Every person who donates, or collects donations and takes part in the event, is helping the Nevada Chapter of the National Hemophilia Foundation send a child to a special medically supervised summer camp, known as Camp Independent Firefly. Kids aged 7 to 17, along with their siblings, are invited to the camp free of charge. The medical staff is on hand to help those with inherited bleeding disorders not only learn about their condition, but help in a number of ways should clients need it. The medical staff will also teach many of the affected campers how to self-infuse medication. This can be a crucial skill for them to learn. Overall, camp goers learn independence and how to simply have fun in a refreshing and comforting environment. 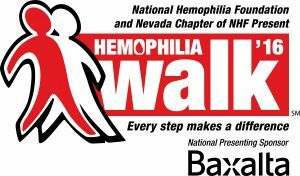 The Nevada Chapter of the National Hemophilia Foundation is the only advocacy group working in support of Nevada’s inherited bleeding disorder community. There is no cure for those affected by inherited bleeding disorders such as hemophilia and von Willebrand disease. The life-long condition in which patients lack a protein allowing their blood to clot normally requires them to use medicine, called factor, to prevent a life-threatening bleed.